An August 2011 special issue of the journal The Holocene will help to move this discussion forward. All scientists who have been part of this debate during the last decade were invited to contribute to the volume. The list of those invited was well balanced between the two views, both of which are well represented in the issue. The papers have recently begun to come online, but unfortunately behind a paywall. Arguably, the most significant new insight emerging from this issue comes from several papers that converge on a view of pre-industrial land use that is very different from the one that has prevailed until recently. Most previous modeling simulations relied on the simplifying assumption that per-capita clearance and cultivation remained small and nearly constant during the late Holocene, but historical and archeological data now reveal much larger earlier per-capita land use than used in these models. The emergence of this view was reported in several presentations at a March 2011 Chapman Conference, and it has attracted recent attention both in Nature and Science News. The following article summarizes this new evidence. Historical data on land use extending back some 2000 years exists for two regions — Europe and China. In a 2009 paper, Jed Kaplan and colleagues reported evidence showing nearly complete deforestation in Europe at mid-range population densities, but very little additional clearance at higher densities. Embedded in this historical relationship was a trend from much greater per-capita clearance 2000 years ago to much smaller values in recent centuries. Similarly, a Holocene special-issue paper by Ruddiman and colleagues pointed to a pioneering study of early agriculture in China published in 1937 by J. L. Buck. Paired with reasonably well-constrained population estimates that extend back to the Han dynasty 2000 years ago, these data show a 4-fold decrease in per-capita land area cultivated in China from that time until the 1800’s. These two re-evaluations of per capita land use have important implications for global pre-industrial carbon emissions. A special issue paper by Kaplan and colleagues used the historical relationships from Europe to estimate worldwide clearance, with smaller per-capita land needs in tropical regions due to the longer growing season that allows multiple crops per year. Their model simulated major forest clearance thousands of years ago not just in Europe and China, but also in India, the Fertile Crescent, Sahelian Africa, Mexico and Peru. The pattern of clearance is nicely shown in a time-lapse sequence available in the Science News article cited above. Kaplan and colleagues estimated cumulative carbon emissions of ~340 GtC (1 Gt = billion metric tons) before the industrial-era CO2 rise began in 1850. This estimate is 5 to 7 times larger than those based on the assumption that early farmers cleared forests and cultivated land in the small per-capita amounts typical of recent centuries. Over millennial time scales, roughly 85% of CO2 emissions to the atmosphere end up in the deep ocean. As a result, Kaplan’s estimated 340 Gt of early anthropogenic carbon emissions to the atmosphere would have resulted in a total pre-industrial CO2 increase of ~24 ppm (340 Gt divided by 14.2 Gt per ppm). A mismatch in timing remains, however, between the early rise of the ice-core CO2 trend and the later rise of Kaplan’s carbon-emissions estimate. One possibility currently being investigated by Kaplan and colleagues is larger early per-capita burning by farmers (and those cultures still in the hunter-gatherer stage). A similar story of decreasing per-capita land use holds for farming practices that generate methane. The paper by Ruddiman and colleagues cites a 1997 study by Ellis and Wang in Agriculture, Ecosystems, and Environment (61: 177-193) reporting a 4-fold decrease from 1000 to 1800 AD in the per-capita size of rice paddy fields in the lower Yangtze River valley. Because of ongoing population growth and the lack of additional arable land, farmers were forced to produce rice on ever-smaller land holdings, resulting in the typical ‘garden-style’ Chinese agriculture. For longer time scales, an in-press paper by Fuller and colleagues on ‘The contribution of rice agriculture and livestock pastoralism to prehistoric methane levels: an archeological assessment’ assembled archeological evidence from hundreds of well-dated sites showing the spread of irrigated rice across southern Asia between 5000 and 1000 years ago. Based on modern regional relationships, they assumed that rice farming in each region subsequently filled in with the log of population density. Combining the first arrival of rice and the subsequent infilling, Fuller and colleagues projected the progressive increase in the total area of southern Asia devoted to irrigated rice. Their estimate showed a rising exponential trend in total area that reached more than 35% of the modern value by 1000 years ago, even though the population in the rice-growing areas of Asia at that time was only 5-6% of modern levels. This mismatch again indicates much greater per-capita land use early in the historical era than in later pre-industrial time. According to this analysis, the increase in CH4 emissions from rice irrigation can account for most of the CH4 rise measured in ice cores between 5000 and 1000 years ago. Fuller and colleagues also mapped the first arrival of domesticated livestock across Asia and Africa and found that a major expansion of pastoralism into wet areas with high carrying capacities began after 5000 years ago. They noted that this spread of livestock would also have made a major contribution to anthropogenic methane emissions and atmospheric concentrations but did not attempt to estimate the amount. The evidence in all of these recent papers converges on the same conclusion: the simplifying assumption of constant per-capita land use used by most previous modeling studies has ignored both historical data and the wide range of contrary evidence assembled by scientists in archeology and related disciplines who do the slow ‘dirty-boots’ field work needed to unravel the real history of human effects on the land. This field-based view was synthesized long ago by Ester Boserup’s seminal work in the 1960’s through the 1980’s. She concluded that the major decrease in per-capita land use through the middle and late Holocene occurred because population growth and the encroachments of neighbors forced farmers to innovate new methods to produce food for their families from less and less land. These papers in the special issue make it clear that future attempts to model past land use should avoid the assumption of constant and small per-capita cultivation and clearance. This emerging view bears on a current discussion over whether or not to designate an ‘Anthropocene’ interval (a time of major human influence on Earth’s system) and, if so, when to place its beginning. Although most opinion seems to favor using the industrial era (the last two centuries or less) as the start, this new evidence offers a different perspective. Forest clearance for cultivation and pastureland is the largest transformation of Earth’s surface that has occurred to date. If well over half of this key transformation occurred prior to the industrial era, then an argument can be made for placing the start of the anthropocene at an earlier time. One possible solution would be to designate two stages: an ‘early anthropocene’ (a time of slow but growing and cumulatively large transformations that began ~7000 years ago for CO2 and ~5000 years ago for CH4) and a ‘late anthropocene’ to mark the many accelerating changes of the industrial era. Other special-issue papers also point to a revised interpretation of a related kind of evidence that bears on early deforestation— the meticulous analyses of the carbon-isotopic composition of CO2 in ice-core air bubbles by the Bern group. Elsig et al. concluded in 2009 in an article in Nature that the small (~0.05o/oo) amplitude of the δ13CO2 decrease during the last 7000 years constrains net emissions of terrestrial carbon to ~50 GtC (one Gt is a billion tons), if fully equilibrated with the deep ocean. As part of their proposed balancing of various carbon sources and sinks, they estimated an anthropogenic contribution of ~50 GtC to the δ13CO2 trend, equivalent to a CO2 increase of 3.5 ppm. But the mass balance calculation in Elsig et al. entailed the questionable assumption that only 40 Gt of carbon has been buried in boreal peats during the last 7000 years, yet this value lies well below a long-respected estimate of 300 GtC by Eville Gorham (e.g. Ecological Applications 1: 182-195, 1991; Gajewski et al., Global biogeochemical Cycles 15: 297-310; 2001). A new analysis by Zicheng Yu in the special issue takes into account both the initial burial of peat carbon and, for the first time in any study, the subsequent decomposition and release of peat carbon after burial. Yu arrives at an estimate of ~300 Gt of carbon burial in peat during the last 7000 years. This much higher value (~300 GtC versus 40 GtC) requires much larger offsetting emissions of terrestrial carbon to satisfy the overall δ13CO2 constraint, but the additional carbon is unlikely to have come from natural sources. Model studies have, on average, placed the net carbon balance caused by natural changes in monsoon vegetation and carbon fertilization close to the 30 Gt size estimated by Elsig and colleagues. These changes cannot account for the emissions needed to offset the much larger amount of carbon buried in peat. The only remaining source left is anthropogenic emissions. The resulting estimate of >300 GtC of preindustrial anthropogenic emissions is in the same ballpark as the land-use simulation estimate from Kaplan and colleagues. If the earlier (Gorham) and more recent (Yu) estimates of large carbon burial in boreal peat are correct, the small negative δ13CO2 trend during the last 7000 years is not an argument against the early anthropogenic hypothesis, but rather an argument in its favor. The two estimates of a pre-industrial anthropogenic CO2 increase of as much as 24 ppm are much larger than previous estimates of 3-5 ppm, but still short of the 40 ppm proposed in the early anthropogenic hypothesis. However, another factor that would have contributed to the pre-industrial anthropogenic total was CO2 feedback from an ocean kept warmer by agricultural emissions of CO2 and CH4 to the atmosphere. A special-issue paper by Kutzbach and colleagues estimates a contribution of as much as 9 ppm from the reduced solubility of CO2 in an ocean warmed by the early anthropogenic CO2 and CH4 emissions to the atmosphere. This, and other possible feedbacks from the ocean, put the total pre-industrial CO2 effect at >30 ppm, closer to the 40 ppm in the original hypothesis. Several papers in the special issue continue to favor a natural explanation for the late-Holocene CO2 and CH4 trends, so the debate is not over. Still, the new evidence points the way toward three avenues of exploration that promise to deliver a resolution of this issue: (1) more thorough investigation of historical records of pre-industrial land use; (2) additional archeological work to fill in gaps in spatial/temporal coverage of the spread of agriculture, and (3) further modeling work to transform historical and archeological data into quantitative estimates of the effects of early agriculture on atmospheric CO2 and CH4 concentrations. So if there was more anthropogenic CO2 in the atmosphere by 1800 than we previously thought, and we have used 350Gt more of the ‘trillion-tonne budget’ than we thought, does that mean climate sensitivity is lower than expected? 1) Do you have a quantitative estimate of the increased CH4 concentrations due to early anthropocene emissions? Very nice summary. What I did find missing was the clearing of forests, not just for agriculture, but for building. This trend has reversed in most industrial nations, but continues in the poorest regions. My question for those here is two-fold. 1. What is the difference in CO2 uptake between the removed forests and the planted crops? 2. What was the albedo effect from deforestation? These answers may help with Fred’s question earlier. This is great! This is one of the most interesting and provocative ideas around and thanks to Professor Ruddiman for taking the time for a thoughtful and fascinating post! @4 / Dan H.: global urban land extent is now estimated ~3% (http://sedac.ciesin.columbia.edu/gpw/docs/UR_paper_webdraft1.pdf) so not sure how significant we would find clearing of forests for buildings. 1) Hypotheses, based on early research, with (properly)-mixed reception, i.e., serious people took the ideas seriously (look at blurbs on Plows, Plagues and Petroleum), but new hypotheses that drastically change worldviews require work to get beyond “interesting, not yet proven.” (Of course, Bill has multiple hypotheses). 3) Modification & refinement of hypotheses. 4) Other scientists get stirred to reexamine existing data and see if it bears on the problem. This issue is particularly interesting because it is highly interdisciplinary, and the relevant papers are scattered all over the literature. 5) Other scientists are stirred to do new research and investigations. 6) As evidence accumulates, hypotheses may still be unresolved, may be refuted … or (as in this case, I think), the evidence is piling up that some old assumptions are likely wrong. 7) At this point, the larger “missing” factors seem to be identified, with research focused not on the structural possibilities, but on uncertainty bounds. 8) The argument may not be over, but I think that the evidence has built, and many more scientists are involved. I speculate that the result may be a major contribution to our knowledge of the Earth’s recent history. a) The hypotheses are simple enough for us lay people to understand. Many aren’t. b) I guess that the whole progress from start to wider acceptance is 10-15 years, wit ha small enough number of key papers to easily watch. c) And it’s happening *now*, so it’s not already long-established textbook stuff. Hence, I hope it will become a good teaching example. Re comment 1: Although our results mean more anthropogenic CO2, they also mean less natural CO2, so there is no net overall change. The Wisconsin group (John Kutzbach and Steve Vavrus) and I have used the mainstream climate sensitivity to convert our estimated early anthropogenic GHG anomalies to temperature (2.5C per CO2 doubling in earlier papers, 2.75-3C more recently). Re comment 2: Thanks. I had pointed out the problem to the editors, and they have now fixed it. Re comment 3: As I noted, Dorian Fuller estimated that the amount of irrigated land was ~35% of modern by 1000 AD. Using the modern area irrigated and best available estimates of its contribution to the current CH4 concentration, he estimates that at least 80% of the observed ~100 ppb CH4 rise ~100 ppb from 5000 to 1000 years ago came from rice irrigation. The livestock spread he mapped will obviously yield quite a lot more CH4. Our estimate of the 9-ppm solubility effect was based on a full GHG anomaly of 40 ppm for CO2 and 310 ppb for CH4 (which adds a non-trivial forcing). If you use the 24-ppm number for direct CO2 emissions instead, you would get something like a 7-ppm solubility effect. The Wisc group and I plan to run a ‘seeding’ experiment with CO2 lower by 24 pp and CH4 by 310 ppb (or slightly less) in an A/OGCM with biochemical feedback to see what CO2 feedbacks we get from solubility and Southern ocean processes. Re comment 4, first question: The average difference in standing carbon pools between forests and either pastures or cropland is generally in the range of 13-18 Gt per million square kilometers. That includes related changes in carbon in the upper soil layers. The numbers are higher in tropical rain forest and lower in subtropical dry forests and boreal forests. Second question: the Wisconsin group (including post-doc Feng He) is running an experiment on the biophysical effects of Kaplan’s clearance pattern. Previous experiments have shown that boreal forest clearance causes a large albedo-driven winter cooling, but almost no one was living in boreal regions until a few centuries ago, so we expect little or no cooling from that for most of the last 7000 years. Nearly everyone lived in the tropics, subtropics, or mid-latitudes, where biophysical effects would likely have been smaller. Re comment #6: Mark Williams, in “Deforesting the Earth”, says that forest clearance for agriculture was 10x larger than that for any other purpose: home building, ship building, creating charcoal for furnaces, etc. I mentioned this aspect here a couple of years ago. In the United States, the introduction of cattle was accompanied by a significant kill off of wild ruminants. The forests they cut down were different from the ones we see today. I was more referring to using the lumber in building homes, ships, etc. Research has shown an increase in forested area in the U.S. over the past century or so. Building does not depend exclusively on urbanization: rural people need shelter too; therefore deforestation for building is in large part proportional to population in tree-covered areas, plus the (small) use for non-residential building (ceremonial, government, etc). Besides other significant sources of deforestation for human use come from the use of fuelwood and charcoal for heating and cooking, and the construction of boats and ships (in preindustrial Europe, from pre-Roman to Early Modern times, entire forests disappeared as trees were cut for ship building). Note that burning emits carbon directly, while large portions of wood cut for building and shipbuilding end sunken on land and sea. More recent work on historical land use in New England, historian William Cronon’s Changes in the Land. Excellent article. I’ve followed this hypothesis with interest for nearly a decade now. The early Holocene is being squeezed out. Perhaps we are moving inexorably to viewing the Holocene as the Anthropocene. The time in which our species rose from having a regional to a global impact. By 11,500 years ago our species was already having a dramatic influenece on megafauna (outside Africa), and so influencing the ecological balance. The article attributes decreased per capita land clearing to increased population pressure. I was thinking that the inadvertent selection effects applied to crop seeds (presumably farmers use the larger seeds for planting) should have resulted in slowly increasing yields of agricultural species. So less acreage could produce more agricultural commodity. It probably wasn’t just the pressure from increasing population that forced the decreasing per capita land clearing, but most likely a lot smaller crop area was needed to feed a human. Houghton, R.A. and J.L. Hackler, Changes in terrestrial carbon storage in the United States. 1: The roles of agriculture and forestry. Global Ecology and Biogeography, 2000. 9:125–144. Thomas, never forget technology. Primitive not-very-wonderful ploughing gives way to better ploughs – thereby leading to better yield for cropping as against seeding by simple scattering. Better yield per area planted feeds more people. The fact that ploughing and other cultivation exposes soil carbon to oxidation isn’t a problem – except to your descendants. Do you have any specific, well-docuemnted examples of entire forests disappearing from these causes in preindustrial Europe? Charcoal, and timber for ships and boats, would have come from managed woods, which were valuable properties, carefully protected and monopolised by their owners. Higher-quality fuelwood too would have been a managed crop, while the lower orders would have gathered fallen branches and offcuts. Population growth would have exercised pressure on the extent of forested areas, but almost entirely through replacing forests by farmland. I wonder whether this research is taking into account evidence presented in books like “1491” that human populations in the New World before Columbus were greater than that of Europe. Some anthropolists provide evidence of substantial alteration of the Amazon during that period. Colonizatin by Europeans brought diseases that reduced Native American populations by on the order of 90%. There is some evidence that major increases in game and forests ocurred in the 1600-1700s throughout North America in response to declines in Native American populations. To comment #9: The most likely reason for ‘clean-looking’ forests was heavy burning of understory vegetation by early Americans. Three papers in the special issue (those by Richard Nevle, Jed Kaplan, and Julia Pongratz, and their respective colleagues) examine the issue of whether the reforestation (and C sequestration) that occurred after disease swept away 85-90% of early Americans had a significant effect on CO2 levels. The Nevle and Kaplan papers concluded yes; Pongratz concluded no. To comment #11: See my response in #8 to comment #6. A widely cited book says agriculture was by far the major source of deforestation. Wood use for other purposes was locally intensive but not regionally extensive. To comment #12: I wasn’t sure what point Hank Roberts was making about the ‘dog-hair’ forests. Anyway, as for his comment about the area deforested being decoupled from the volume, see my reply in #8 that the generally accepted range of carbon emissions per area deforested is 13-18 GT per million square kilometers. This conversion number is an index of the volume/area relationship that is widely used by ecologists and land-use modelers, and it puts the volume/area relationship in a narrow range. To comment #13: About early American burning, see my response above to comment #9. To comment #14: Thanks. I agree that the Holocene is disappearing, but maybe that is just as well. To me, it was always just another in a long series of interglacials and not deserving of special designation. Humans are the main (only?) reason it is different. To comment #15: Boserup and others assume that people use the ‘easiest’ technology available to get their food (with the least labor). Hunter-gatherers in most regions could eat well and nutritiously on a few hours of gathering a week and an occasional mammal kill. Boserup showed that farming the same plot of land every year was much more labor-intensive (weeding, keeping livestock as a source of manure, providing them with fodder for the winter, picking insects, protecting crops against wild animals, etc), so in this view people would not have chosen to do this unless there was pressure to do so. To comment #17: In the industrial era, mechanical plows opened up vast areas of prairie and steppe. But plow improvements in previous times were different. They were used mainly to keep repeatedly cultivated plots weed-free and did not increase per-capita land use. But they did increase labor. To comment #18: Jed Kaplan and colleagues have pointed to historical evidence of large-scale deforestation in Europe well before the industrial era. The forests disappear as a (non-linear) function of population density, at a time when most people were farmers. Consistent with major deforestation being caused by farming. To comment #19: See my response to comment #9 above. Your answer to Dan H on albedo in #4 was a bit vague. Can you quantify it just a bit, at least going so far as to say whether or not a particular scenario represents an increase or decrease in albedo, i.e. more or less reflection, without bothering with how much? I’d also point out that season is probably relevant as well, first because in cropland the albedo will change more with the seasons (darker in the spring before growth begins, then more foliage, then changing dramatically as either crops are harvested, or plants die off). Second, the relative importance of the albedo in different seasons would vary (due to the change in the angle of incidence of sunlight, and length of the day). I’m just trying to get a handle on which direction, overall, albedo changed (i.e. exaggerating or negating some CO2 increases), and a broad guess at a factor (1/8? 1/4? 1/2?). I understand that the answer is a research paper all to itself… just a heavily qualified educated guess is fine. #18, 20–I offer this diffidently, as the research I’ve done on the topic is rather casual. But I believe it is historically correct that management attempts (beginning by the end of the 17th century) were driven in part by the status of specific oak species as ‘strategic materials’ for naval warfare–Colbert, the French Intendant, is said to have planted forests for the purpose. And English shipbuilders were increasingly forced to import North American oak, though they considered it less desireable. To illustrate, Nelson’s “Victory”–the flagship at Trafalgar, and incidentally still a commissioned warship, though it’s now aground, not afloat–required more than 3,000 oak trees for its construction, as well as smaller numbers of other species. The picture I get is one of management attempts that probably helped, but which were being developed in response to impending or breaking supply crises. That doesn’t give much info on how shipbuilding compared with land clearance, of course; given that the overwhelming demand was specifically for oak, I’d think that shipbuilding’s impact must have been limited geographically–what percentage of European forest was pure stands of oak? The construction of the Spanish Armada. But quite supported in the literature. Like Dan H (#4) I was surprised that the summary, at least, makes no mention of albedo. The Earth Radiation Budget Experiment (ERBE) showed significant seasonal difference in albedo and even a trend. If the earth’s albedo was to change from 0.31 to 0.30 this would lead (assuming the Stefan–Boltzmann 4th power law) to a 2.3 C increase in temperature which in turn would have a significant impact on CO2 exchange processes. I guess it has been taken into account, but it seems to me that the warmer and drier conditions of the Holocene would in themselves lead to more natural forest and grass fires, so increasing CO2 output. This natural feedback greatly outweighs any effects of human use of fire. That is a strong assertion that you have numbers for the two effects. Can you cite peer-reviewed research that backs that (with credible) numbers? Despite a strong anthropogenic fingerprint on 20th Century wildland fire activity in the American West, climate remains a main driver. A better understanding of the spatiotemporal variability in fire-climate interactions is therefore crucial for fire management. Here, we present annually resolved, tree-ring based fire records for four regions in the American West that extend back to 1400 CE. In all regions, years with high fire activity were characterized by widespread yet regionally distinct summer droughts. Overall fire activity was high in late Medieval times, when much of the American West was affected by mega-droughts. A distinct decline in fire activity in the late 16th Century corresponds with anomalously low temperatures during the Little Ice Age and a decline in Native American fire use. The high spatiotemporal resolution of our fire record discloses a time-frequency dependent climatic influence on wildfire regimes in the American West that needs to be accounted for in fire models. re #26 John I was responding to “The most likely reason for ‘clean-looking’ forests was heavy burning of understory vegetation by early Americans”. I know this is the popular view (in Australia as well) but it is presented without any backing of numbers, “credible” or otherwise. I have written extensively on this topic in Australia over several decades – there is no evidence here that Aboriginal burning significantly changed vegetation patterns or affected animal species. You are asking me to prove a negative. But it does seem to me that the change from Pleistocene climates to Holocene ones almost certainly must have affected natural fire regimes. re #27 Thanks David. Yes, I know the Holocene was a lot better than the LGM. But it in turn was worse than the previous few thousand years (when in Australia, for example, inland lakes were full that have been essentially dry ever since). I suppose all I am saying is that a change in vegetation patterns in the Holocene in response to changes in climate from late Pleistocene will in turn have affected natural fire regimes which n turn will have affected ghg production even without postulated human actions. re #27 Thanks David. Yes, I know the Holocene was a lot better than the LGM. But it in turn was worse than the previous few thousand years (when in Australia, for example, inland lakes were full that have been essentially dry ever since). I suppose all I am saying is that a change in vegetation patterns in the Holocene in response to changes in climate from late Pleistocene will in turn have affected natural fire regimes which in turn will have affected ghg production even without postulated human actions. This information is very timely because I had been thinking along these lines for the last few weeks. (I’m a retired art historian, but have spent most of my time since retirement studying climate change. I had wondered about the slow temperature descent over the last 8000 years and why it differed from temperature descents following the four previous optimums, which were rapid. I had wondered about an anthropogenic contribution related to burning and clearing accompanying the spread of civilizations and whether there enough humans and carbon-creating activities to affect the climate significantly, that is, enough to slow the descent indicated by the rhythm of the Milankovitch cycle. I was wondering whom I could ask (after I paid my taxes), so this information is most gratifying. Can anyone tell me whether the properties Milankovitch identified as causing major temperature changes over the last 800,000 years or so are presently in a relationship that should reduce global temperature (were it not for offsetting conditions, such as anthropogenic CO2 creation? With all due respect, Australia is not the world, and I would suggest that aboriginal burning might not be the same as slash-and-burn to clear forests for agriculture. I live in California, which fears hot/dry fire seasons as much as you do in Oz. (and Rick, thanks for the paper, but its not the same thing). I am unconvinced of this general assertion. The point is that wildfires may increase if climate becomes hotter&drier, but after a forest burns, it usually grows back, which is not what happens when humans clear forests and keep them clear. A large part of Nevle,Bird, Ruddiman and Dull (2011, to appear in The Holocene) deals with biomass burning in the American neotropical area, which of course is different from arid/semi-arid areas, and has a lot more biomass. At the very least, the issue is being argued in the journals. Marlon, et al (2008) argue one way, these folks think human land use matters more. So, maybe hold the argument until that paper appears, and hope that Bill will return to explain that one also. A couple of questions and points. Can someone explain the low point in GHG and its decline more or less matching the Holocene Climatic Optimum? “One possibility currently being investigated by Kaplan and colleagues is larger early per-capita burning by farmers (and those cultures still in the hunter-gatherer stage)”. What burning do hunters and gathers do? Do we really mean slash and burn which would make more sense and probably leave behind scant evidence? Much of the evidence of more extensive land clearing seems to come from the last 2,000 years and this could understandably account for GHG rise during that time. But what about the 3,000-5,000 before that? I am dubious there was that much outside of the Mediterranean and China before the last 2,000 years. During the last 2,000, of course, we can point to extensive agriculture in North, South, and Middle America. Several comments (#4, 21, and 24) seek answers to the possible albedo (‘biophysical’) effects of early deforestation. Although not my expertise, I suggest Bala et al. (www.pnas.org/cgi/doi/10.1073/pnas.0608998104). They show that complete deforestation of boreal forests would cause major winter cooling, because the dark green spruce/fir canopy gives way to bright reflective snow-covered ground. Clearing mid-latitude forests (with far fewer evergreens) has a much smaller winter cooling effect. Clearing tropical forests produces two counteracting effects: a small warming from losing the moderating effects of water vapor recycled by trees in evapotranspiration, versus a small cooling effect from extra clouds. So — how do these results apply to pre-industrial clearance? The answer obviously depends on the pattern of early clearance you trust. Jed Kaplan’s historically grounded earlier clearance? Or the previous model simulations that suggested little pre-industrial clearance? Given my stated preference for Jed’s reconstruction, what does it imply about the effects of pre-industrial clearance on global climate? For most of the last 7000 years, there was no significant clearance of boreal forests, because the far north was a poor place to farm. Some clearance occurred in the eastern Baltics and western Russia after 1400 when western Europe ran out of wood and started to look to other areas for more lumber (including the east coast of North America). But it is hard to argue for major human effects on albedo in boreal regions. Pre-industrial forest clearance in mid-latitude Europe and China may have caused some winter cooling in areas with persistent snow cover, but not during the snow-free summers. Most pre-industrial forest clearance occurred in the tropics, but probably with relatively little net effect on regional/global temperature. As noted in my post #8, the Wisconsin group is working with Kaplan’s group to model the climatic effects. As for comments about fire (#25-30): Experts are divided about the relative importance of natural versus anthropogenic fire. But there are a few cases where the answer is clear. After the Maori people arrived in New Zealand in 1280, an estimated population of ~100,000 burned vast parts of the islands during the next century or two (McWethy et al., 2009. The Holocene 19: 883-897. Doi: 10.1177/0959683609336563). They did that to let the Sun in to boost the growth of understory bracken with very nutritious roots. The numbers work out to almost 100 hectares burned per person (compared to typical per-capita forest clearance for agriculture in the range of 1-10 ha). Is the use of coal in both Europe and China for thousands of years, collected from beaches, the surface or simple mines, now considered negligible compared to deforestation? Also peat? E.g. the creation of the Norfolk Broads in England due to mass use of peat as a fuel. Also negligible in comparison? Thanks for a great update on the latest research in this area. Do you plan to update Plows, Plagues and Petroleum? The Milankovitch cycles are such that every 4th cycle has low eccentricity. Based on Milankovitch theory, the next ice age is a long way off. Thanks for the posting. I’m pleased that we’re looking at the actual causes of pre-industrial climate variation and taking a very close look at human impacts. I’m sure the closer we look, the more we’ll find. I recently read (Hale: Lords of the Sea) that forests around Athens were depleted for shipbuilding purposes circa 400 BC. I’m intrigued by the possibility that the little ice age was caused by population declines in the Americas. up 2 ppm in 2009 with emissions of 29 GtCO2 (~8 GtC). RE comment #36: I have made crude estimates of these fuel sources. For example, what would have been the effect if some estimated % of the population in China used coal in their stoves for heat and cooking over the last 2000 years? For coal in China and peat and coal in northern Europe, I got emissions estimates of a few GtC each, much smaller than agricultural clearance. These guess-timates should be redone by people who are more qualified. RE comments #37 and #39: Princeton Press thought enough of Plows, Plagues… to re-release it in their Princeton Library Series and ask if I wanted to write a new afterword. I did and it updated things to 2009-2010. Some of the new stuff is in my post here. I have begun writing an intro-level textbook (e-book) focused on the natural-versus-anthropogenic debate. Its scope and tone would be much like the points John Mashey made in #7: an example of a real scientific debate in action, and one that is understandable. Of course, the burden will be on me to be honest. Re comment #38: My post here did not address a corollary of the early anthropogenic hypothesis: whether (small) ice sheets would now be growing in the far northern hemisphere, had it not been for GHG’s from early farming. The orbital data alone suggest we are close to the point of glacial inception, but not at the current or pre-industrial GHG’s. 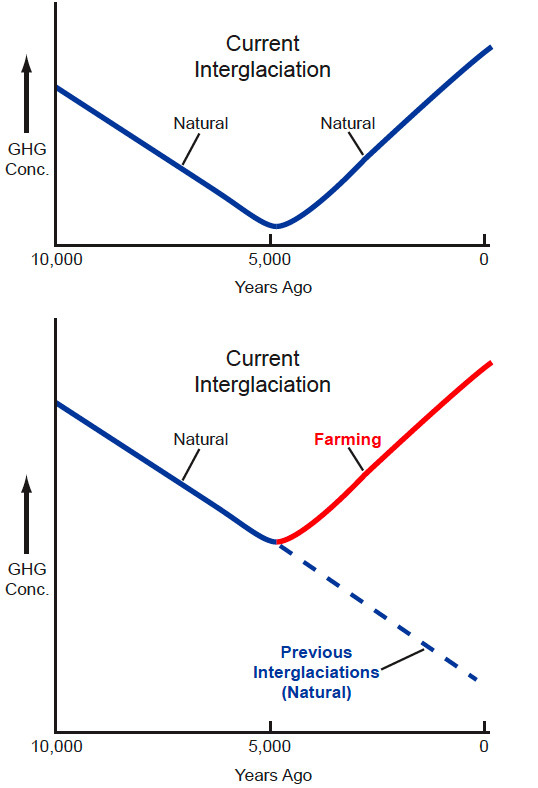 A special-issue paper by Vavrus et al suggests the lower values without early farming would be enough to start glacial inception, but another special-issue paper by Vettoretti-Peltier suggests they would not. Re comment 40: See the special-issue papers by Pongratz et al and Nevel et al. for two different views on this proposed link. Re comment 41: The current situation is different, because it is dominated by short-term C exchanges that are far from long-term balance. But if we stopped C emissions today and then came back 1000 years in the future, ~85% (some say 90%) of our industrial-era C emissions would be in the ocean. I’d be curious to hear prof Ruddiman’s take on this paper, as they seem to arrive a opposite conclusions. Like Bill, I too thank everyone for staying on topic and civil, and asking good questions and making good comments. As John has noted, this is how scientific discussions should proceed, and there’s no inherent reason they cannot occur in the blog world as well. Bob, Bill addressed your question well, and if I was vague it was because I was just mentioning general considerations. I agree with him that the albedo effects of clearing conifer forests, whose time-integrated albedo is as low or lower than any other forest type (typically, very dark foliage with relatively long lifetimes), and which tend to dominate in areas with winter snow cover, is typically much more significant than for other forest/biome types. But if pre-history human densities were low in such areas, which makes sense, then, as Bill explained, clearing rates would also have been low and thus the global effect due to albedo changes, minimal. Your statements in your second paragraph are right, and was at least partially what I was referring to when I mentioned the importance of the cropping system, as that determines the seasonal course of both albedo and evapotransipiration. Bill also mentioned the latter. This can be very important indeed, at least locally to regionally, perhaps even larger. Forest clearing drastically changes the seasonal course of surface and subsurface water flow, and the corresponding evapotranspiration rates have an enormous, and often critical, effect on the local energy budget. If the clearing was as great as has been estimated in some of these studies, this could have had a widespread effect on the surface temperature, depending on other critical variables, particularly cloud formation rate, height, and lifetime. This is a topic with a good literature base, much current interest, and worthy of another post. If time permits, which it does not right now, we’ll do that. Or I can at least try to pull together some relevant references and post them. I was pleased to read this post, because I’ve long been uncomfortable with the seeming assumption that human contribution to GHGs was negligible prior to the industrial revolution. Something I’ve wondered about is how much impact one of the practices of early hunters may have had: burning large areas of grass land in order to chase large herds of animals over cliffs, etc. – a practice that appears to reach back at least 12,000 years, and perhaps started much earlier. The CO2 release itself might have been relatively insignificant, but how did it shift the balance of grasslands and forests? Re#45: Lighting fires is still the main way of clearing land and keeping it clear for livestock … see Lauk and Erb … 2.2 gigatonnes dry matter in Sub-Saharan Africa. A farmer burning to plant a crop lights a small fire because they can’t plant a huge area, but those running cattle can and do burn much bigger areas. You don’t need huge modern populations to light huge fires. So per capita burning rates would rise quickly as you travel back in time. I think you are really stretching it with the idea that hunters and gatherers are setting fires and clearing land. It makes no sense for hunter-gatherers to destroy the grasslands which is the primary source of food for large game animals they are hunting and a key part of hunting and gathering is gathering of plants which would also be destroyed by fire. Is there anywhere today where hunters and gatherers setting large fires? The notion that native people need to burn for ease of sight and movement is laughably ethnocentric. Native people can hunt and move in jungles without burning them down. I really am missing the imperative to move beyond a slash and burn explanation. Certainly in tropical areas of Southeast Asia, MesoAmerica, and South America probably the earliest agriculture was slash and burn. Much of this I believe would leave little evidence of its magnitude or extent simply because with a diminishing population the areas would grow back over in jungle and with increasing population the form of agriculture would have to be replaced with cultivated crops which would mask the earlier presence of slash and burn. Re comment #43: The paper by Beni Stocker et al. is the most recent in a series of previous land-use papers referred to in my initial post but not named. Their first two simulations use variations on the HYDE model with the built-in assumption of small, constant per-capita land use for the last 7000 years. The point of my post here was to summarize historical and archeological evidence that this assumption is not valid. Their last two simulations assume higher early land use, but go toward the opposite extreme by assuming no (or virtually no) deforestation during the last 1000 years, which is clearly implausible. They also show no obvious clearance in the very heavily populated Aztec and Inka empires. In contrast, Jed Kaplan’s simulation uses a historically-based relationship between forest clearance and population density in Europe. One of the authors on this paper is Kees Klein Goldewijk, the person who created the HYDE model with the assumption of small constant per-capita clearance (used by Stocker for the first two simulations). Kees’ presence on Kaplan’s paper is an indication of a new ‘emerging view on early land use”. Re comment #44: Nothing to add, except support for Jim’s idea of a future post on the albedo effects of clearing. Re comments #45-47: These contrasting opinions echo my point in comment #35 that experts simply don’t agree about natural versus anthropogenic burning. In addition to intentional burning, some scientists have argued that “escaped fires” were common and would have burned large areas during dry seasons (Charles Kay at Utah State for one). As for reasons for hunter-gatherers to burn (#47): Fires don’t “destroy grasslands”. They allow sun in so that berries can grow, which feed humans and attract animals and fowl that humans can hunt, and they fertilize grasses for the next season’s growth, which attracts grazers. Here on the U.S. east coast, those grazers included not just deer, but also buffalo, a common place name from upstate NY southward at least as far as Virginia. Also #47: Charcoal leaves reasonably permanent evidence of long-ago deforestation and reforestation. The paper by Nevle et al in the special issue provides a good summary of what was occurring in central and South America before (and after) Columbus. I understand that you disagree with Stocker’s assumption regarding historical per-capita land use. However, they also seem to argue that a relatively low biogenic carbon flux is inferred from the isotopic composition of icecore CO2. Doesn’t that provide a limit to the amount of biogenic carbon that early human societies could have emitted via their landuse? I am having a hard time finding the Nevle article but from what I can gather the proof you are talking about is from about the last 1-2 thousand years. I wouldn’t dispute that, What I am questioning is the 3-5 thousand years before that when GHG started rise. Patterns of land use were much different in the last 2 thousand years. The extensive Mississippian based on maize cultivation arose during this time. This was real agriculture, not hunting and gathering, and not slash and burn either, although probably an extensive amount of burning was involved in much of the manner you suggest. But this evidence with which I largely agree doesn’t account for the GHG rise in the early period so it might be that natural processes in addition to human activity is at work.